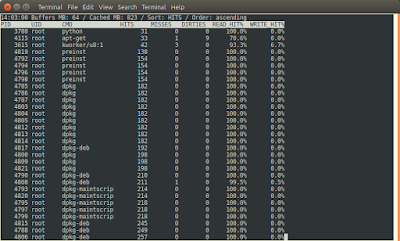 Typically each tool can take 10-25+ hours of compute time to analyze the kernel source; fortunately I have a large server at hand to do this. 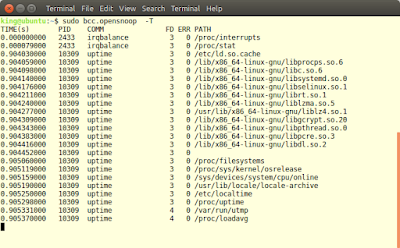 The automated analysis creates an Ubuntu server VM, installs the required static analysis tools, clones linux-next and then runs the analysis. The VMs are configured to minimize write activity to the host and run with 48 threads and plenty of memory to try to speed up the analysis process. At the end of each run, the output from the previous run is diff'd against the new output and generates a list of new and fixed issues. I then manually wade through these and try to fix some of the low hanging fruit when I can find free time to do so. As one can see, there are a lot of defects getting fixed by the Linux developers and the overall trend of outstanding issues is downwards, which is good to see. The defect rate in linux-next is currently 0.46 issues per 1000 lines (out of over 13 million lines that are being scanned). A typical defect rate for a project this size is 0.5 issues per 1000 lines. Some of these issues are false positives or very minor / insignficant issues that will not cause any run time issues at all, so don't be too alarmed by the statistics. Using a range of static analysis tools is useful because each one has it's own strengths and weaknesses. 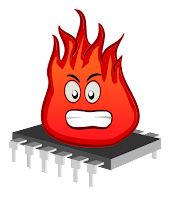 For example smatch and sparse are designed for sanity checking the kernel source, so they have some smarts that detect kernel specific semantic issues. 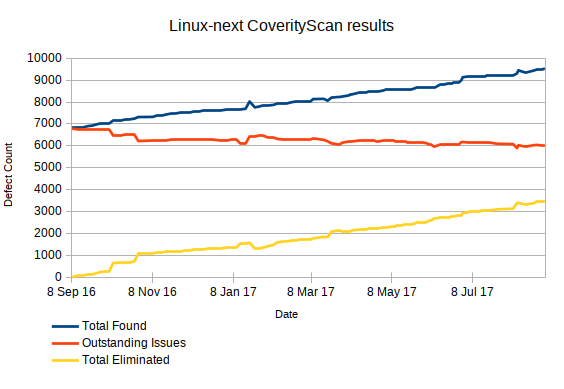 CoverityScan is a commercial product however they allow open source projects the size of the linux-kernel to be built daily and the web based bug tracking tool is very easy to use and CoverityScan does manage to reliably find bugs that other tools can't reach. Cppcheck is useful as scans all the code paths by forcibly trying all the #ifdef'd variations of code - which is useful on the more obscure CONFIG mixes. Finally, I use clang's scan-build and the latest verion of gcc to try and find the more typical warnings found by the static analysis built into modern open source compilers. The more typical issues being found by static analysis are ones that don't generally appear at run time, such as in corner cases like error handling code paths, resource leaks or resource failure conditions, uninitialized variables or dead code paths. My intention is to continue this process of daily checking and I hope to report back next September to review the CoverityScan trends for another year. The latest release of stress-ng V0.08.09 incorporates new stressors and a handful of bug fixes. So what is new in this release? 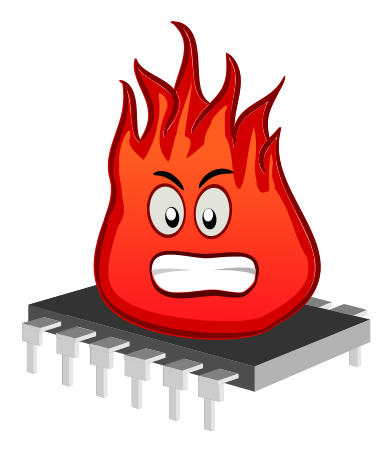 ...the memrate stressor will attempt to limit the memory rates but due to scheduling jitter and other memory activity it may not be 100% accurate. By careful setting of the size of the memory being exercised with the --memrate-bytes option one can exercise the L1/L2/L3 caches and/or the entire memory. By default, matrix stressor will perform matrix operations with optimal memory access to memory. The new --matrix-yx option will instead perform matrix operations in a y, x rather than an x, y matrix order, causing more cache stalls on larger matrices. This can be useful for exercising cache misses. To complement the heapsort, mergesort and qsort memory/CPU exercising sort stressors I've added the BSD library radixsort stressor to exercise sorting of hundreds of thousands of small text strings. Finally, while exercising various hugepage kernel configuration options I was inspired to make stress-ng mmap's to work better with hugepage madvise hints, so where possible all anonymous memory mappings are now private to allow hugepage madvise to work. The stream and vm stressors also have new madvise options to allow one to chose hugepage, nohugepage or normal hints. No big changes as per normal, just small incremental improvements to this all purpose stress tool. ..so I've now added support for these events too. I've also added some extra per-process information on each event. The new -x "extra info" option will now also display the UID of the process and where possible the TTY it is associated with. This allows one to easily detect who is responsible for generating the process events. 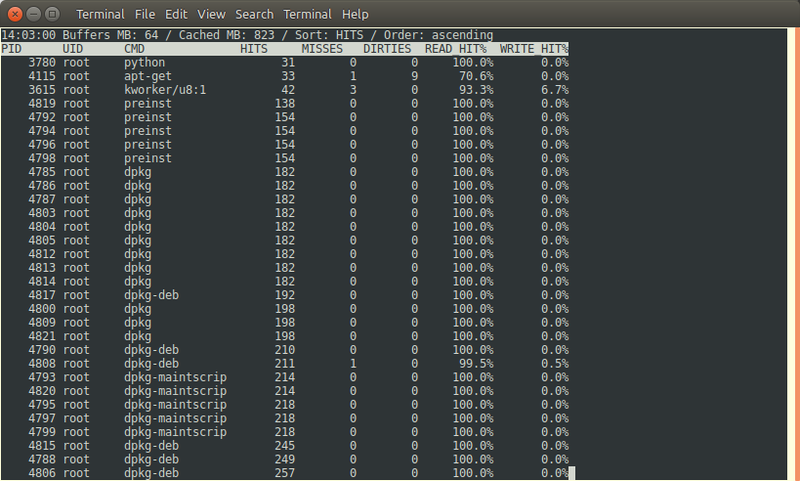 Process 17376 runs strace on process 17350 (top). We can see the ptrace attach event on the process and also then a few seconds later the detach event. We can see that the strace was being run from pts/15 by root. Using forkstat we can now snoop on users who are snooping on other user's processes. I use forkstat mainly to capture busy process fork/exec/exit activity that tools such as ps and top cannot see because of the very sort duration of some processes or threads. Sometimes processes are created rapidly that one needs to run forkstat with a high priority to capture all the events, and so the new -r option will run forkstat with a high real time scheduling priority to try and capture all the events. 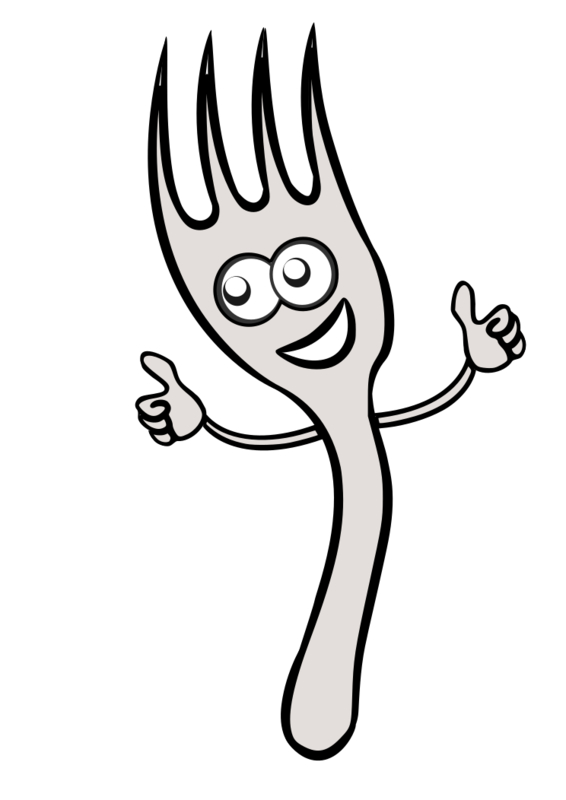 These new features landed in forkstat V0.02.00 for Ubuntu 17.10 Aardvark. The latest release of stress-ng contains a mechanism to measure latencies via a cyclic latency test. Essentially this is just a loop that cycles around performing high precisions sleeps and measures the (extra overhead) latency taken to perform the sleep compared to expected time. This loop runs with either one of the Round-Robin (rr) or First-In-First-Out real time scheduling polices. The cyclic test can be configured to specify the sleep time (in nanoseconds), the scheduling type (rr or fifo), the scheduling priority (1 to 100) and also the sleep method (explained later). The latency percentiles indicate the latency at which a percentage of the samples fall into. For example, the 99% percentile for the 10,000 samples is the latency at which 9,900 samples are equal to or below. The latency distribution is shown when the --cyclic-dist option is used; one has to specify the distribution interval in nanoseconds and up to the first 100 values in the distribution are output. 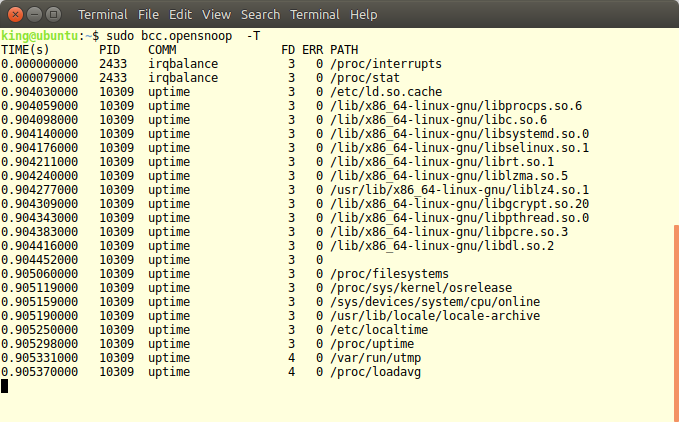 Note that stress-ng needs to be invoked using sudo to enable the Real Time FIFO scheduling for the cyclic measurements. enable latency distribution statistics with an interval of 1000 nanoseconds between each data point. From the run above, we can see that 99.5% of latencies were less than 9821 nanoseconds and most clustered around the 4880 nanosecond model point. The distribution data shows that there is some clustering around the 5000 nanosecond point and the samples tail off with a bit of a long tail. ..the above invokes all the vm class of stressors to run all at the same time (with just one instance of each stressor) for 60 seconds. poll (busy spin-wait on clock_gettime() to eat cycles for a delay. All the delay mechanisms use the CLOCK_REALTIME system clock for timing. I hope this is plenty of cyclic measurement functionality to get some useful latency benchmarks against various kernel components when using some or a mix of the stress-ng stressors. Let me know if I am missing some other cyclic measurement options and I can see if I can add them in. Keep stressing and measuring those systems! What is new in FWTS 17.05.00? 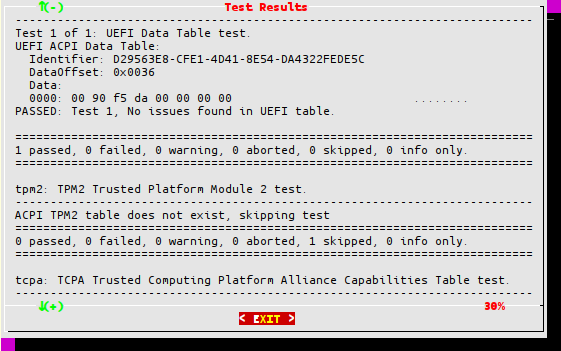 Version 17.05.00 of the Firmware Test Suite was released this week as part of the regular end-of-month release cadence. So what is new in this release? As ever, we are grateful for all the community contributions to FWTS. The full release details are available from the fwts-devel mailing list. I expect that the next upcoming ACPICA release will be integrated into the 17.06.00 FWTS release next month. 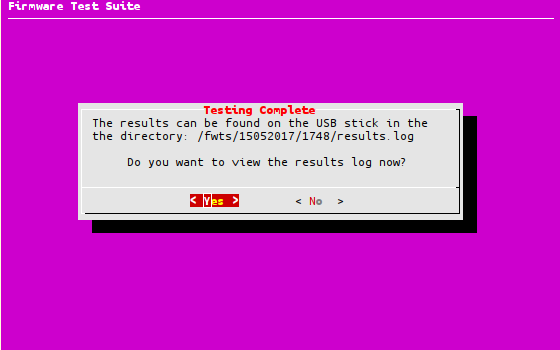 The Firmware Test Suite (FWTS) has an easy to use text based front-end that is primarily used by the FWTS Live-CD image but it can also be used in the Ubuntu terminal. 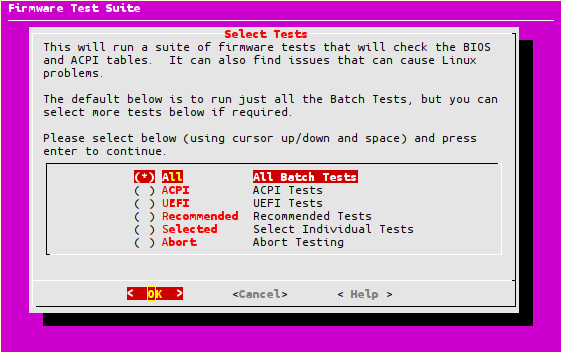 Tests will be run one by one and a progress bar shows the progress of each test. Some tests run very quickly, others can take several minutes depending on the hardware configuration (such as number of processors). 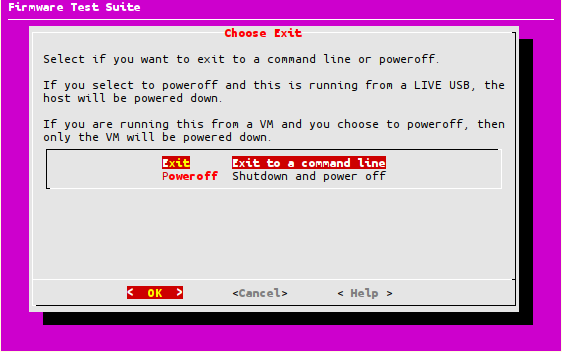 Press enter to exit (note that the Poweroff option is just for the fwts Live-CD image version of fwts-frontend). drwxr-xr-x 5 root root  4096 May 15 18:09 ..
drwxr-xr-x 2 root root  4096 May 15 17:49 .
acpidump.log is a dump of the ACPI tables in format compatible with the ACPICA acpidump tool. 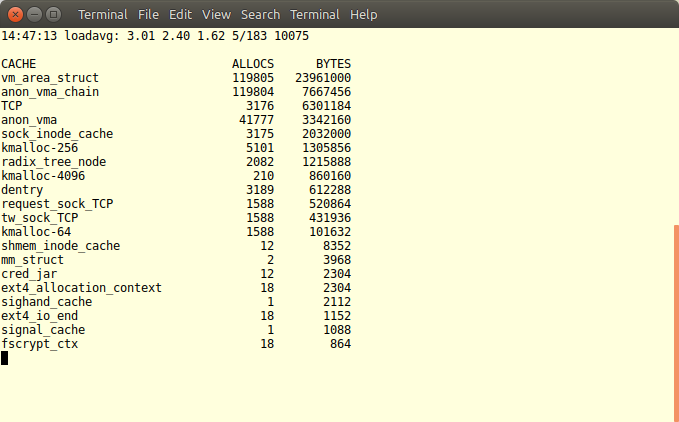 The results.log file is a copy of the results generated by FWTS and results.html is a HTML formatted version of the log. The latest release of stress-ng 0.08.00 now contains a new job scripting feature. Jobs allow one to bundle up a set of stress options into a script rather than cram them all onto the command line. One can now also run multiple invocations of a stressor with the latest version of stress-ng and conbined with job scripts we now have a powerful way of running more complex stress tests. The job script commands are essentially the stress-ng long options without the need for the '--' option characters. One option per line is allowed. One can also add comments using the # character prefix. By default the stressors will be run in parallel, but one can use the "run sequential" command in the job script to run the stressors sequentially. #  proceeding comment to enable these options if required. #  show all debug, warnings and normal information output. # fix s, m, h, d or y. #  zones, where as others may have none. #  stress method with the --matrix-method option. Various example job scripts can be found in /usr/share/stress-ng/example-job, one can use these as a base for writing more complex stressors. The example jobs have all the options commented (using the text from the stress-ng manual) to make it easier to see how each stressor can be run. Version 0.08.00 landed in Ubuntu 17.10 Artful Aardvark and is available as a snap and I've got backports in ppa:colin-king/white for older releases of Ubuntu. 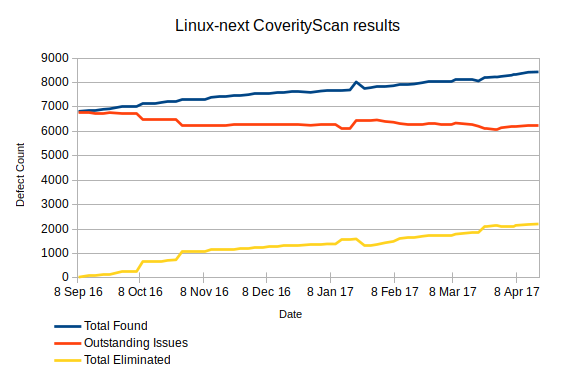 Over the past 6 months I've been running static analysis on linux-next with CoverityScan on a regular basis (to find new issues and fix some of them) as well as keeping a record of the defect count. Since the beginning of September over 2000 defects have been eliminated by a host of upstream developers and the steady downward trend of outstanding issues is good to see. A proportion of the outstanding defects are false positives or issues where the code is being overly zealous, for example, bounds checking where some conditions can never happen. Considering there are millions of lines of code, the defect rate is about average for such a large project. I plan to keep the static analysis running long term and I'll try and post stats every 6 months or so to see how things are progressing. The BPF Compiler Collection (BCC) is a toolkit for building kernel tracing tools that leverage the functionality provided by the Linux extended Berkeley Packet Filters (BPF). BCC allows one to write BPF programs with front-ends in Python or Lua with kernel instrumentation written in C. The instrumentation code is built into sandboxed eBPF byte code and is executed in the kernel. I've found the funccount tool to be especially useful to check on kernel activity by checking on hits on specific function names. Hopefully this will give you a taste of the useful tools that are available in BCC (I have barely scratched the surface in this article). I recommend installing the snap and giving it a try. As it stands,BCC provides a useful mechanism to develop BPF tracing tools and I look forward to regularly updating the BCC snap as more tools are added to BCC. Kudos to Brendan Gregg for BCC!